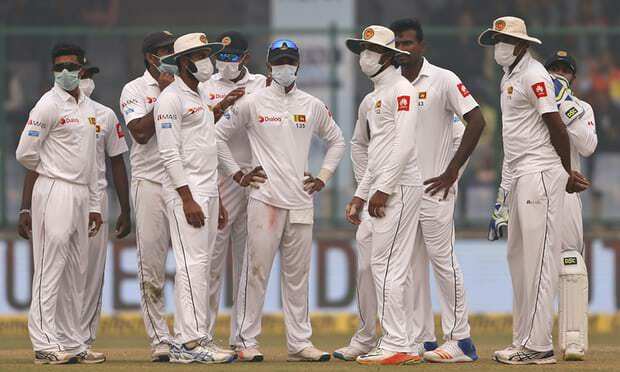 A cricket Test match between India and Sri Lanka was repeatedly interrupted on Sunday with claims players were “continuously vomiting” due to hazardous pollution levels in the Indian capital. Commentators said it was the first recorded instance of an international match being halted due to the toxic smog that afflicts much of north India year-round but worsens to hazardous levels during winter months. India need 7 wickets as day 5 starts. Toss: Sri Lanka won the toss and elected to field. Dhoni thinks he is so hot and he's NOT! If I hurry, I may be up to see the end of this match. India are batting like Crap! I imagine the Indian crowd is pissed? They can be a bit volatile... set fire to stadiums etc. Sri Lanka have won just five out of 27 completed ODIs this year. But if there's a way to turn around a disappointing year, it can't get better than ending it with their first-ever series win in India. India, meanwhile, have not lost a series at home all year, across formats.